Exotic superfoods, such as chia seeds, cacao, coconut oil, or goji berries, are frequently praised by the modern nutrition media. But what about the seemingly normal, healthful foods we - and our grandparents - grew up eating? Don’t they deserve a little credit? You bet they do! You don’t need hard-to-pronounce herbs from the Amazon to add years to your life, you just need a generous dose of primary food and plenty of antioxidants, which can be found in a number of grocery store standards. Antioxidants play an important role in maintaining overall health by balancing unstable free radicals and slowing down the aging process. Consuming natural sources of these vital nutrients could play a key role in longevity and vitality, as they stabilize molecules that are weakened by pollution, UV damage, and even the chemical byproducts of life itself. Antioxidant-rich foods also reduce inflammation, maintain skin elasticity (less wrinkles! ), and prevent degenerative diseases like cancer and Alzheimer’s disease. 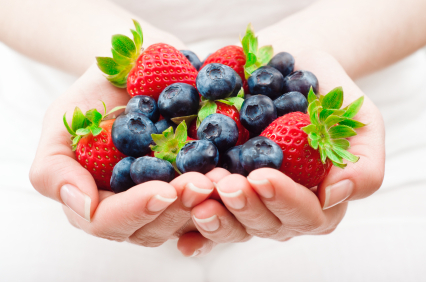 Berries contain a high amount of antioxidants called anthocyanins, which give them their bright colors. These substances help reduce oxidative stress and degeneration, improve brain function and eye health, and even prevent DNA damage. Berries taste great as a healthy snack, dessert, or in a smoothie! Cruciferous vegetables contain generous amounts of various antioxidants like vitamin C, beta-carotene, and zinc among others. Best known for their role in cancer-prevention, this group includes broccoli, cauliflower, and kale. They also contribute to detoxification, hormonal balance, and bone health. Cruciferous veggies are best eaten raw in a salad, or blanched, sautéed, or baked. Beans, in addition to being antioxidant-rich, also contain important nutrients like folic acid, vitamin B6, magnesium, and fiber. These nutrients combine to help maintain a healthy digestive system, regulate blood sugar, and maintain cardiovascular health. Beans are healthiest when purchased dried, then soaked and cooked at home. What are your favorite antioxidant-rich recipes? Thank you for joining the conversation! Jess will be replying soon! How Much Vitamin D Do I Need and When? Is Eating Healthy Really That Expensive? Created by To A Healthier Me: Jessica Grajeda ©, All Rights Reserved. The information on this website is not intended to replace a one-on-one relationship with a qualified health care professional and is not intended as medical advice. To A Healthier Me and Jessica encourage you to make your own health care decisions based upon your research and in partnership with a qualified health care professional. Disclaimer: The entire contents of this website are based upon the opinions of Jessica Grajeda, unless otherwise noted. The content provided is for information purposes only. To A Healthier Me ©, All Rights Reserved. Simple theme. Powered by Blogger.